ASDIP STEEL includes the design of base plates as well as the anchorage system. This blog post covers the principal design steps. This structural engineering software is based on the AISC Design Guides # 1, Blodgett “Design of Welded Structures”, and the ACI 318-11 Appendix D.
Base plates are structural elements at the bottom of columns to spread the concentrated load over a larger supporting area, so that the bearing stresses are under the acceptable limits. Depending on the type of frame the column belongs to, the base plate may be subject to compression, tension, bending and shear. In practice, most columns are W-sections subjected to compression, shear, and bending about the strong axis. Strain compatibility. What theory to use? There are two main theories for base plate design: one is based on the AISC Design Guides # 1 and it assumes that the base plate is flexible, therefore the strain compatibility is ignored. This theory provides equations for two cases: when the Eccentricity e < L/6, and when e > L/6. The transition between these two cases is not smooth, and the results may be quite different for slightly different eccentricities in the border line of the two cases. 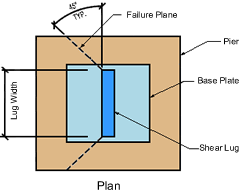 The second theory is based on the Blodgett book, and it assumes that the plate is rigid and therefore the plane sections remain plane after bending, so the strain compatibility is met. This theory provides consistent equations for any eccentricity values, as shown in the graphs below. Note the abrupt changes in both the rod tension and the plate thickness per the AISC approach for eccentricities nearby the kern. ASDIP STEEL performs the calculations per either theory. For compression columns subjected to small moments, there’s no tension in the rods, so the goal is to keep the concrete bearing pressure under the acceptable limits. As the applied moment increases, only a portion of the plate is under compression and the anchor rods provide the required tension to maintain the static equilibrium. The Code philosophy is to treat separately tension and shear, and then combine both effects in an interaction diagram. The design of anchor rods in tension implies checking the limit states of steel strength, concrete breakout, pullout, and side-face blowout. The calculation of the breakout is particularly important since a concrete failure would be non-ductile, and therefore should be avoided. Anchor reinforcement may be provided in order to avoid a breakout failure, and in this case the tension is taken completely by the rebars. ASDIP STEEL performs all these Code check calculations and generates a graphic view of the tension breakout area. 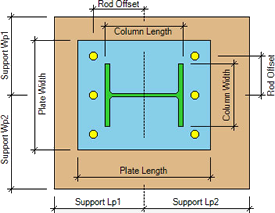 For columns under compression, usually the friction between the plate and the concrete is large enough to resist the applied horizontal load. When this is not the case, then the shear needs to be resisted by either a shear lug, or by the anchor rods. The shear lug consists of a plate welded perpendicularly to the bottom of the base plate, which acts in bearing against the concrete, thus taking the shear load off of the anchor rods. In this case the checks include the steel capacity in bending and shear, weld strength, concrete bearing and concrete breakout. For large shear loads it’s common to design a combination of shear lug and anchor rods to resist the shear and tension respectively. 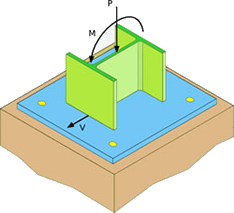 For small to moderate shear loads, the anchor rods may be used to transfer the shear to the foundation. In this case the limit states to be checked include the steel strength, concrete breakout and concrete pryout. Since the holes in the plate are oversize, it’s unlikely that all the rods will bear against the plate to resist the shear. Unless the washers are welded to the plate, only the front rods are effective for calculation purposes. Anchor reinforcement may be provided to prevent a brittle failure. ASDIP STEEL generates a graphic view of the shear breakout area. 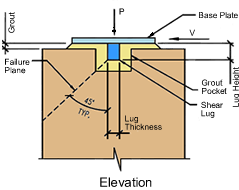 Below is a typical anchorage design report in ASDIP STEEL. Note that the interaction of tension and shear usually controls the design of the anchor rods. Detailed information is available about this structural engineering software by visiting ASDIP STEEL. Go ahead and download a Free 15-Day Software Trial or go ahead and Place Your Order. Is the program accepting Moment and Shear force in two directions? No, this version only accepts moments in one direction, around the strong axis of the column. This is the current methodology of the AISC. The next version will include biaxial moments in base plates. 3 number of Anchor Rod can be placed in one direction only? If we need 3 number of anchor rod in both direction, what can i do in base plate design? In this version you can only model anchor rods effective in the strong axis of the column.